Reporter Aggie Underwood devoted a chapter in her 1949 autobiography Newspaperwoman to covering the stars – and one of the stars she covered was Thelma Todd. Thelma, nicknamed the Ice Cream Blonde, was an enormously popular actress appearing in over 120 films between 1926 and 1935. Thelma was born on July 29, 1906, in Lawrence, Massachusetts. She was a good student and wanted to become a schoolteacher. She completed high school and went on to college, but she was a pretty girl and her mother insisted that she enter a few beauty contests. She won the title of “Miss Massachusetts” in 1925, and competed in the “Miss America” pageant. She didn’t win, but she did come to the attention of Hollywood talent scouts. Among the stars with whom Thelma appeared during her career were Gary Cooper, William Powell, The Marx Brothers, and Laurel & Hardy. During the late 1920s and early 1930s there were several successful male comedy teams but studio head Hal Roach never gave up on the idea of pairing two women. Between 1931 and 1933 Thelma and Zasu Pitts appeared in over a dozen films, primarily two-reelers. When it came time for contract renegotiation Zasu and Thelma found out that Hal Roach had made certain that their individual contracts expired six months apart. He figured that the stars had less leverage separately than they would as a team. He’d pulled the same trick on Laurel and Hardy. Zasu’s bid for more money and a stake in the team’s films was a non-starter with Roach. She was given a take it or leave it option. She left. Thelma’s new partner was wisecracking Patsy Kelly and they churned out a series of successful shorts for Hal Roach until 1935. Thelma’s pleasant voice had made the transition from silent to sound films an easy one. She had name recognition and with financial backing from her lover, film director Roland West, she opened the Thelma Todd’s Sidewalk Café. Thelma and Roland lived in separate rooms above the café. They had known each other for about 5 years. Thelma had appeared in West’s 1931 film Corsair, and that is when they became romantically involved. West’s estranged wife, Jewel Carmen, lived in a home about 300 feet above the café on a hill overlooking the Pacific Ocean. It was an odd domestic arrangement to be sure. On Saturday, December 14, 1935 Thelma’s personal maid of four years, May Whitehead, helped to dress the actress in a blue and silver sequin gown for a party. At about 8 p.m. Thelma and her mother Alice were preparing to leave the Café together. Thelma was headed to a party at the Trocodero hosted by Ida Lupino and her father Stanley. As they were about to get into the limo driven by Ernie Peters (one of Thelma’s regular drivers) Roland approached Thelma and told her to be home by 2 a.m. Not one to be given orders, Thelma said she’d be home at 2:05. 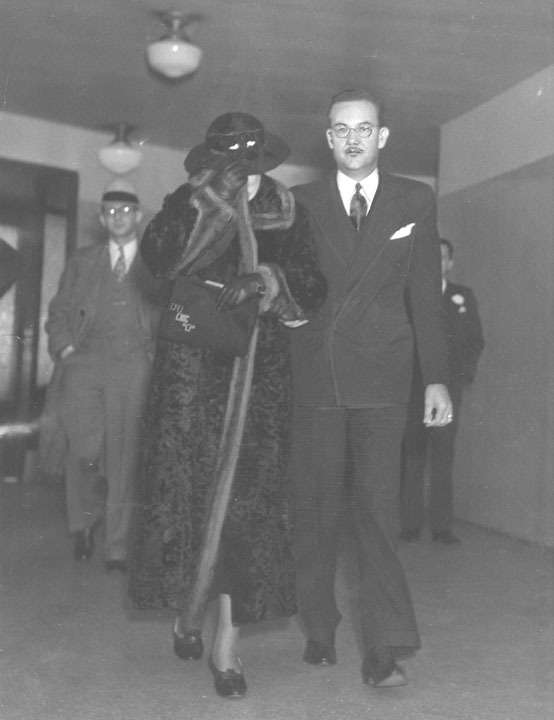 When he was questioned later, West characterized his exchange with Thelma as more of a joke than a serious demand on his part; but he had locked Thelma out at least once before when she had failed to arrive home “on time”. On that earlier occasion Thelma had knocked hard enough to break a window and Roland let her in. According to party goers Thelma arrived at the Trocodero in good spirits and she seemed to be looking forward to the holidays. She downed a few cocktails and she was intoxicated, but none of her friends thought that she was drunk. Thelma’s ex-husband, Pat Di Cicco, was at the Trocodero with a date, but he was not a guest at the Lupino’s party. 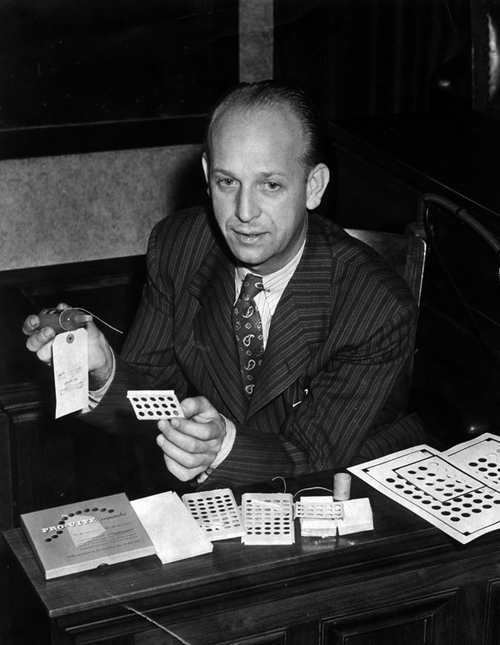 Very late in the evening Thelma joined Sid Grauman’s table for about 30 minutes before asking him if he’d call Roland and let him know that she was on her way home. Thelma’s chauffeur said that the actress was unusually quiet on the ride home, and when they arrived she declined his offer to walk her to the door of her apartment. He said she’d never done that before. It’s at this point that the mystery of Thelma Todd’s death begins. On Monday, December 16, 1935, May Whitehead, had driven her own car to the garage, as she did every morning, to get Thelma’s chocolate brown, twelve cylinder Lincoln phaeton and bring it down the hill to the café for Thelma’s use. May said that the doors to the garage were closed, but unlocked. She entered the garage and saw the driver’s side door to Thelma’s car was wide open. Then she saw Thelma slumped over in the seat. At first May thought Thelma was asleep, but once she realized that her employer was dead she went to the Café and notified the business manager and asked him to telephone Roland West. Alice Todd leaves Thelma’s inquest. The circumstances surrounding Thelma’s death were somewhat mysterious, and when her mother Alice Todd received the news she shrieked “my daughter has been murdered”. 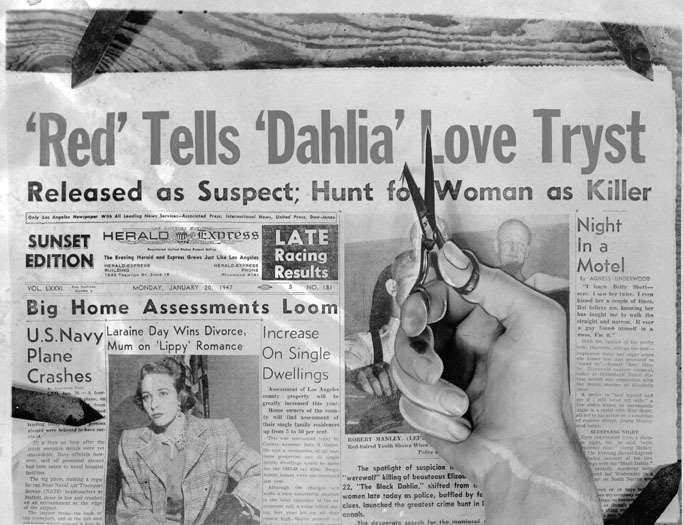 It was up to the cops and criminalists to determine if Thelma’s death had been a suicide, accident, or murder. An investigation of the death scene found that the light inside the garage was not switched on and that there was some blood on Thelma’s face and there were also droplets of blood inside the car and on the running board. The Coroner said Thelma may have been dead for about twelve hours before she was discovered. But a few witnesses came forward to swear that they’d seen, or spoken to, Thelma on Sunday afternoon at a time when, according to the Coroner, she would have already been dead. The most compelling of the witnesses who had claimed to have seen or spoken with Thelma on Sunday was Mrs. Martha Ford. She and her husband the actor Wallace Ford were hosting a party that day to which Todd had been invited. 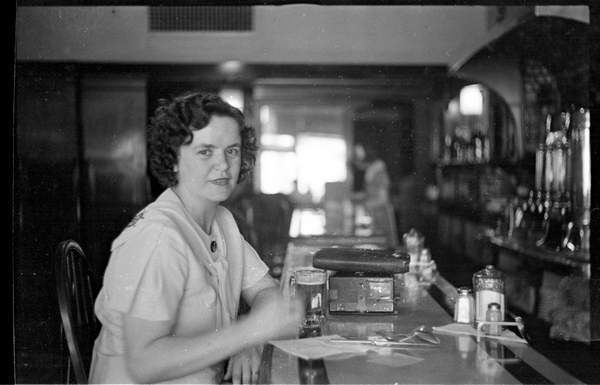 She said that she received a telephone call and that she’d at first thought the caller was a woman named Velma, who she was expecting at the party; but then the caller identified herself as Thelma, and used the nickname, Hot Toddy. Martha said that Toddy asked her if she could show up in the evening clothes she’d worn the night before to a party — Martha told her that was fine. “Toddy” also said she was bringing a surprise guest and said “You just wait until I walk in. 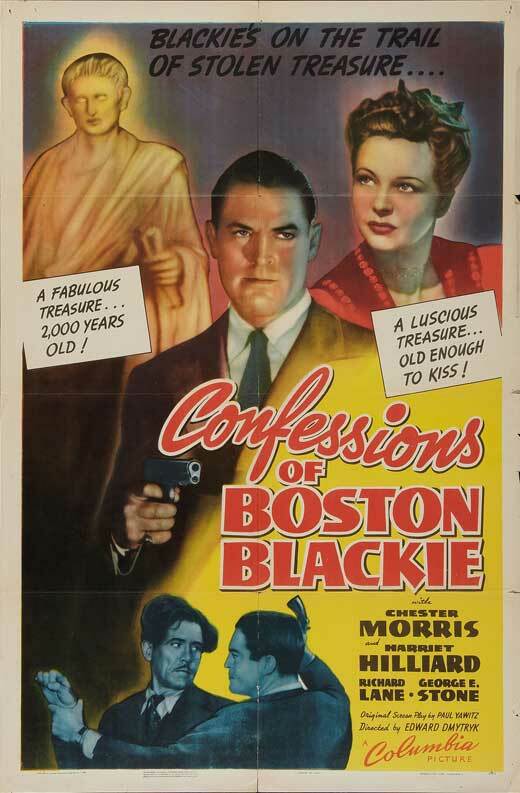 You’ll fall dead!” Mrs. Ford was absolutely convinced that she had spoken with Thelma and not an impostor. 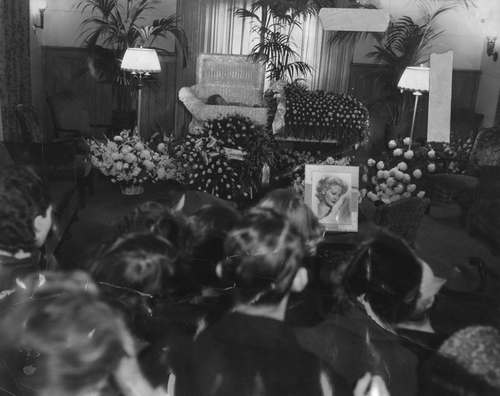 There was an enormous outpouring of grief over Thelma Todd’s death. 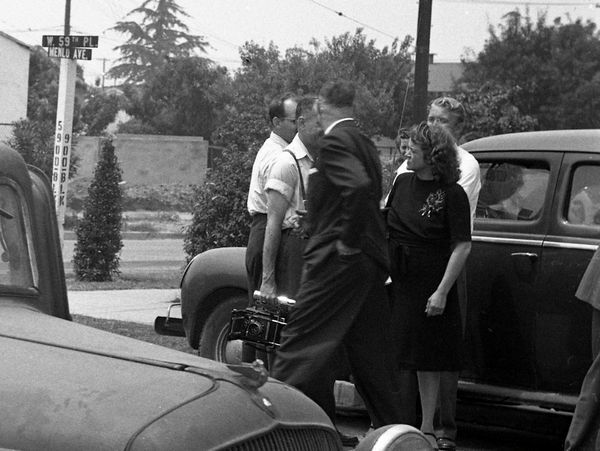 And hundreds of mourners from all walks of life visited Pierce Mortuary where Thelma’s body was on view from 8:00 a.m. to 1:00 p.m. on December 19, 1935. Patsy Kelly was said to have been so upset that she was under a doctor’s care. And Zasu Pitts was devastated. She had been out Christmas shopping with Thelma a few days before her death. The sightings of Thelma on Sunday led to a multitude of theories, ranging from plausible to crackpot. Among the theories that have gained popularity over the years, even though it is unsubstantiated, is that New York mobster Lucky Luciano was pressuring Thelma to host gambling at the Café but when Thelma said no, he had her killed. Another theory is that Thelma was murdered by her ex-husband, Pat Di Cicco. He had a history of violence against women; but again, there is no evidence that he had anything to do with her death. I have my own theory, of course. How could I not? Here’s what I believe happened. On Saturday night as she was leaving for the Trocodero, Roland West had told Thelma to be home at 2 am. He wasn’t joking with her as he’d said. Asserting herself, she told him she’d be home at 2:05 – but it was about 2:45 or 3 am when she asked Sid Grauman to phone West and let him know that she was on her way. Her chauffeur, Ernie, said they arrived at the café at about 3:30 a.m and she had declined his offer to walk her up to her apartment. I believe that she declined because she anticipated an ugly scene with Roland about her late arrival home. She had a key in her evening bag, but the door to the apartment had been bolted from the inside. Roland had locked her out again. She was tired and she’d been drinking, her blood alcohol level was later found to be .13, enough for her to be intoxicated but not sloppy drunk. She decided that she didn’t have the energy to engage in an argument with Roland – it must have been about 4 am. It was a cold night at the beach so Thelma trudged the rest of the way up the stairs to the garage. She opened the garage doors and switched on the light. She got into her car and turned on the motor in an effort to keep warm. She fell asleep and was dead of carbon monoxide poisoning within minutes. She fell over and banged her head against the steering wheel of the car which caused a small amount of blood to be found on her body and at the scene. The blood was later tested and it contained carbon monoxide, so her injury occurred inside the garage. According to tests made by criminalist Ray Pinker, it would have taken about two minutes for there to have been enough carbon monoxide in the garage to kill her. He had even tested the car to see how long it would run before the engine died – the shortest time it idled was 2 minutes 40 seconds, the longest was 46 minutes 40 seconds. What about the light switch and the open car door? I think that when Roland didn’t hear anything from Thelma he decided to look for her. He walked to the garage to see if she’d taken her car. 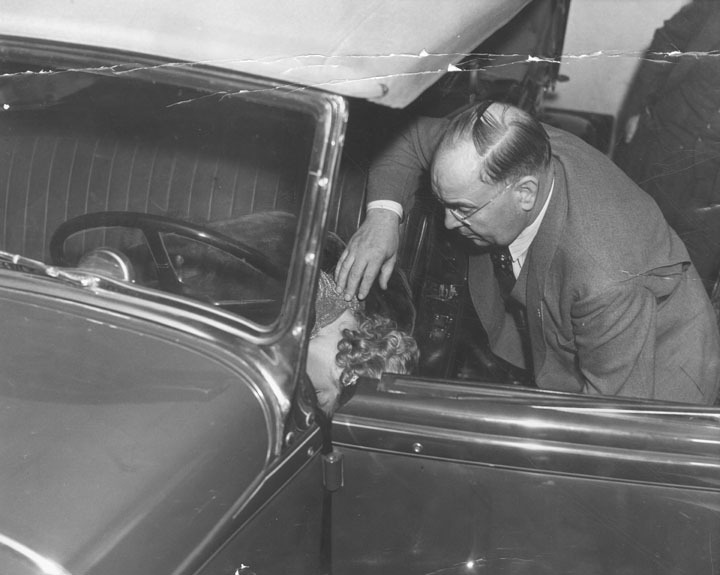 He went inside and saw Thelma slumped over in the front seat, just the way May Whitehead would find her on Monday morning. The car’s motor was no longer running. He swung open the driver’s side door to awaken her and realized that she was dead. He was too stunned to do anything but get the hell out of the garage. He left the driver’s side door open, switched off the garage light, closed the doors, and went back to his apartment. West was never held accountable, there was no proof of wrongdoing on his part, but I believe that he felt responsible for Thelma’s death. He never told a soul about the truth of that night; unless you believe the rumor that he made a death bed confession to his friend, actor Chester Morris. 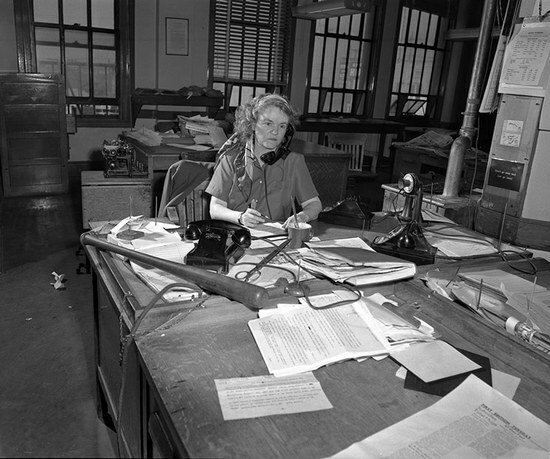 What about Martha Ford’s alleged telephone conversation with Thelma? Was it actually Thelma on the phone? Maybe Ford was mistaken about the time. It is one of the many loose ends in the mystery surrounding Thelma Todd’s death. 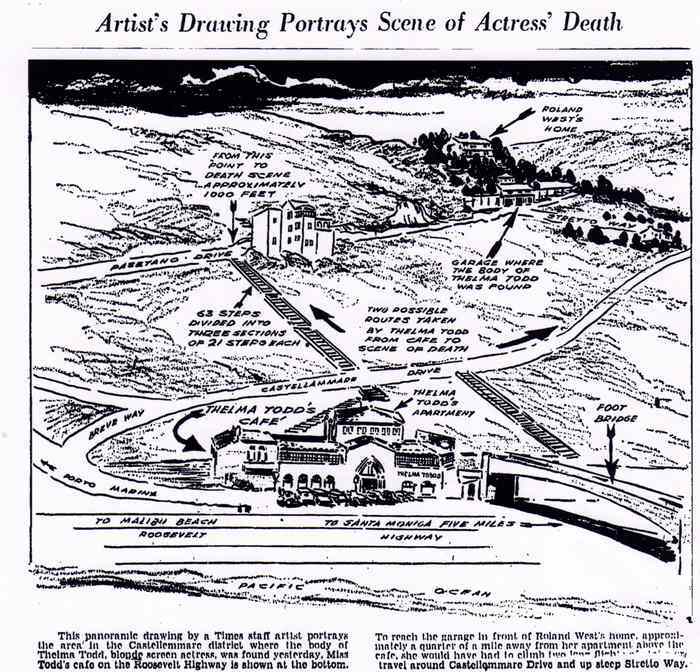 Aggie was finishing her first year as a reporter for Hearst when Thelma Todd died. 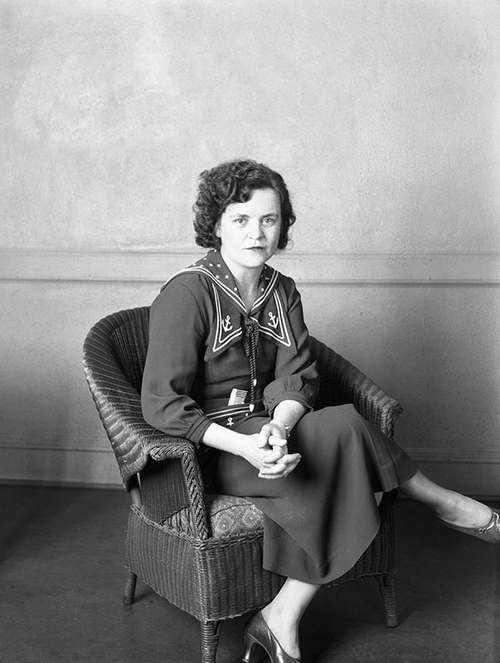 According to her memoir, by the end of the autopsy only she and the coroner remained in the room; her colleagues had turned green and bolted for the door. Over the decades Thelma’s death has been the subject of books, movies, and TV shows; and it has been attributed to everything from suicide, to a criminal conspiracy. I think it is best if Aggie and I leave you to make up your own mind about what really happened to Thelma Todd.